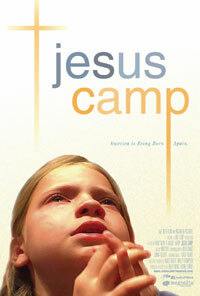 Jesus Camp is one of the most disturbing movies I’ve ever had to sit through. I did it to myself, I know. I knew it would be bad. I had no idea. Coming out of the theater, I felt my stomach churning and my palms sweating. I felt like I had just seen a dead body; like I had just walked up on the rotting corpse of progress laying face-down in a ditch, motionless. I am done playing nice. I’ve read the reviews about this movie, and I don’t understand why more people haven’t been absolutely shaken to their very core by this film (just as the Evangelical Fisher says we should). It feels like a declaration of war. It feels like everything special about this world is under a direct threat by a bunch of smiling drones. This film made me want to have children and I don’t even want to want to have children. One thing is clear. We can’t just take this sitting down. THIS IS THE AMERICAN TALIBAN! The only difference is that they don’t have to use explosives to destroy - yet. These born-agains draw parallels between themselves and extremist Muslims time and again throughout the film. “We have to raise these kids to join the army of god because, I’m sorry, we’re right!” These are statements that chill the bone. I wanted to throw up. 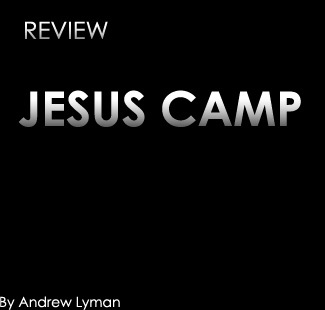 These are seven and eight year old kids being led to believe that it’s “cool” to die for Jesus. These are six year olds who are afraid to dance for the fun of it (for the flesh) because it’s sinful. These are nine year olds being taught (in home-school) that global warming doesn’t exist, that “science doesn’t prove anything,” and that teachers at other schools would say, “Creationism is stupid and anyone who believes it is stupid!” These kids are lied to! They are brought up without an ounce of preparedness for any element of the real world. They are being raised clinically psychotic; with no responsibility for their own actions and guilt for everything it is to be a human child. They don’t have to think about anything because it is all given to them. There is no questioning. There is no evaluation. There only is the word of God (as told to them by their pastors). These Evangelicals destroy with a smile and a hug. They have completely co-opted the “wholesomeness” of traditional Christianity and discarded the content. There is no talk of humbleness, or charity, or respect; there is only the enemy. Why do kids need to be taught that global warming doesn’t exist? Why are they lied to and told that a seven week old fetus looks just like a tiny baby? These children are being drafted into political wars they cannot possibly comprehend! They are being manipulated to serve their parents' and church's fanatical ends. I have no doubt that the parents’ intents are authentic, and that is what frightens me. They are so deluded that they will never see any other world - the real world. I feel ill just writing about this again. It’s ironic that these kids say they feel sick when talking to non-evangelicals. When I hear this sentiment out of the mouths of babes, that same hate wells inside of me, but it makes sense. We are all human beings. However, I cannot tolerate this type of ignorant, reckless destruction of everything we have accomplished. Fanaticism is the most dangerous foe of progress, and we are becoming a nation of fanatics. I have no idea what to do about this. I am shaken and at a complete loss. I need to think about this for a long time. I need to run for office, or become a teacher - a biology teacher. I need, we need, to do something. We have a hard road, though. As was once said to me, rationalism will always lag behind because it must be. It is not merely reaction, it is understanding. Furthermore, it is content to leave everything well enough alone. Rationalism’s aim is not to destroy. Its aim is to create. I wish that someone could reach these kids and teach them that faith is not what makes this world beautiful and exciting. The world is beautiful and exciting. The protoplasm (“Whatever that is!” –from a pastor in the movie) is infinitely more fascinating than divine craft. Science is the product of wonder where faith merely extinguishes it. Faith does not allot for wonder. These are the lost children of the next generation. They are the ones that need saving, not us. It frightens and upsets me to no end that everything I find beautiful and exciting about this world could be so despised by another human being.